In this article I will show a simple functioning example of using Yahoo!’s YUI API to bind a Calendar control with a single HTML text field as in the image to the left. I provide example code for this below. For this example I have created a simple HTML page containing one text field. 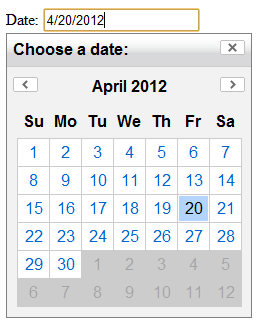 The intent is to display a YUI calendar control below the text field when the text field is clicked. The first step in this process is to import the correct YUI libraries. To do this, simply select the Calendar control filter in Yahoo!’s Dependency Configurator tool, and the CSS style and .JS include reference will be generated for you. In this code, the init_calendar function is called when the Page DOM is ready for rendering. Then add the init_calendar function and instantiate the Yahoo! Calendar widget and also remember to hook up the Yahoo! widget event listeners for the ‘focus’ and ‘blur’ events. Finally within the init_calendar function make sure to register the selectEvent.subscribe method to tell your Calendar what to do once a date has been clicked on the Calendar. In this example the selectEvent.subscribe method is hard-coded to set the selected date to the correct text field element. However this can be dynamically handled if there is more than one Date-related text element on the page.